Diabetic retinopathy (DR) is a microvascular complication that eventually afflicts virtually all patients with diabetes mellitus (DM) (1). Despite decades of research, there is presently no known cure or means of preventing DR, and DR remains the leading cause of new-onset blindness in working-aged Americans (1). Several nationwide clinical trials have demonstrated that scatter (panretinal) laser photocoagulation reduces the 5-year risk of severe vision loss (i.e., best corrected visual acuity of 5/200 or worse) from proliferative DR from as high as 60% to less than 4%. Additionally, timely and appropriate focal laser photocoagulation for clinically significant diabetic macular edema (DME) reduces the risk of moderate vision loss (i.e., a doubling of the visual angle) from DME from nearly 30% to approx 12%. Vitrectomy surgery, with endolaser photocoagulation as indicated, can frequently prevent further vision loss or restore useful vision in eyes that have nonresolving vitreous hemorrhage or traction retinal detachment threatening central vision. 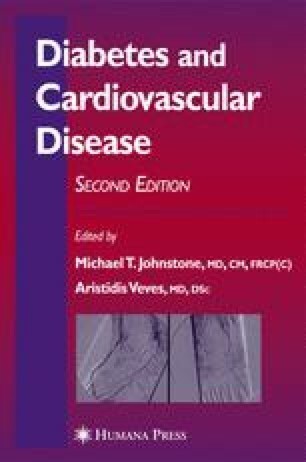 Although numerous new therapies are under investigation with some already in phase 2 or 3 clinical trials, until a prevention or cure for diabetes is discovered, the keys to preventing vision loss from DR are regular eye examinations to determine the need for timely laser photocoagulation and rigorous control of blood glucose and any accompanying systemic medical conditions, such as hypertension, renal disease, and dyslipidemias.